Jennifer Acker, editor of The Common, Amherst College’s award-winning literary magazine, will appear on Writing the Short Story panel in the 2018 WriteAngles conference. 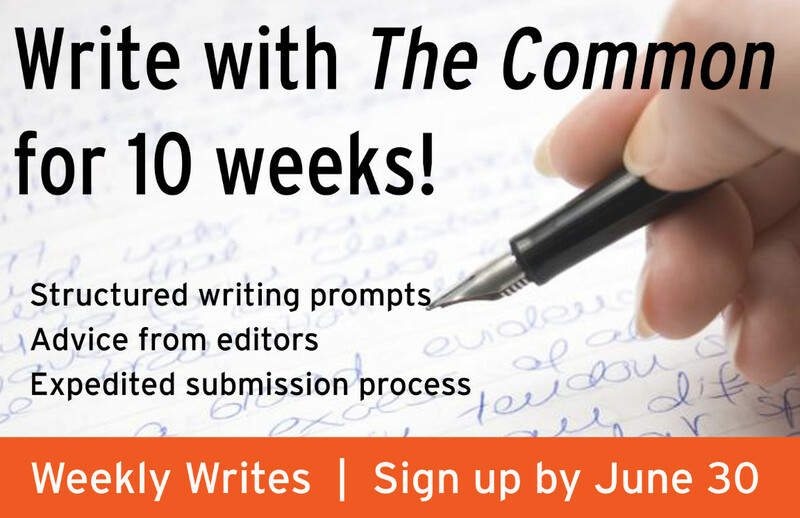 The Common is launching its first ever Weekly Writes program on July 1, 2018. Weekly Writes is a ten-week program designed to help participants create original place-based fiction and nonfiction. Sign up is open until June 30, and the $15 fee includes one free, expedited submission to the magazine after program completion. Three writing prompts appropriate for both beginning and advanced writers. Two of these prompts will focus on generating new material and the third will guide participants through the process of writing one longer short story. Examples that accompany the prompts, which were directly inspired by content from the magazine. Weekly writing advice from the editors and insights into what they’re looking for when selecting work for The Common. After the completion of this program, participants will have three months to submit one piece for free, and receive a decision within one month. Send questions to info@thecommononline.org.